April Playdates Open - Enroll Now! Our musical playdates for April 2019 are open for enrollment. Click the button below to choose your date and enroll your family! 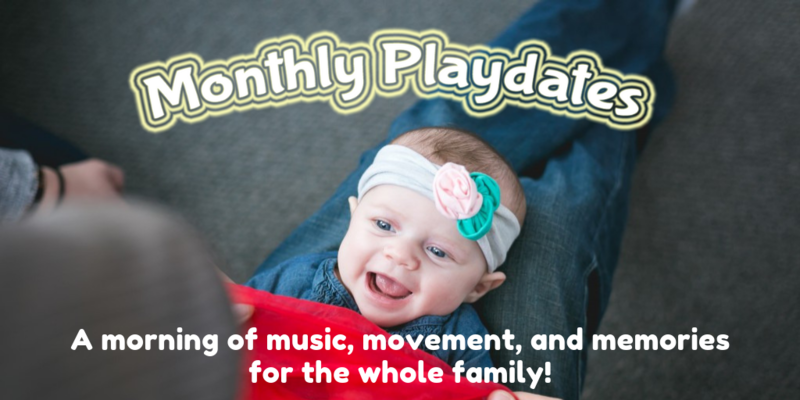 A playdate packs all the music and magic of our weekly recurring classes into a one-time, energy-filled morning event for the whole family. Our monthly playdates are offered two to three times a month, centered around a different theme every month. Playdates are for children ages 0-7 and as many caregivers as wish to come along! At a playdate, each child takes home an instrument/prop related to the theme, 10 Kindermusik songs, and a $10 coupon for our weekly classes. Cost is $15 for your first child and just $5 each for siblings. Attending a playdate is a great first step if you’re new to Kindermusik. We predict you’ll fall in love with the energy, movement, laughter, and learning packed into those 40 minutes!